CAPE CANAVERAL, Florida -- On April 8th, 2014, the Earth, Mars, and sun will be arranged in almost a straight line. Astronomers call this alignment "opposition" because the sun and Mars are on opposite sides of the Earth. That means that Mars will rise in the east just as the sun is setting in the west, and Mars will be setting in the west just as the sun is rising in the east. To the viewer on Earth, Mars will be directly overhead at midnight (viewer's local time) tonight. But this alignment on April 8th won't be the closest that Mars and Earth are together. That's because the planets' orbits around the sun are elliptical instead of perfectly round. The date that Mars and Earth will be closest together occurs on April 14, 2014. The same night a 'Blood Moon' total lunar eclipse occurs. 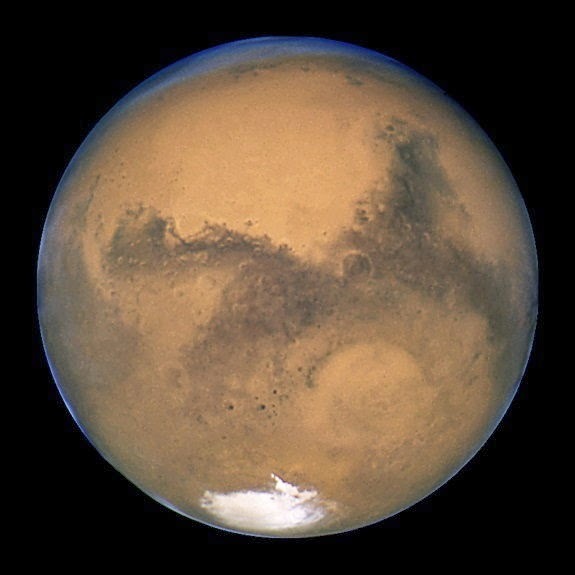 Mars will be so close to Earth this week that amateur astronomers with backyard telescopes will be treated to a viewing of the Red Planet in great detail, including being able to see the Martian polar ice cap that is made up of regular water ice and frozen carbon-dioxide (commonly known as dry ice).